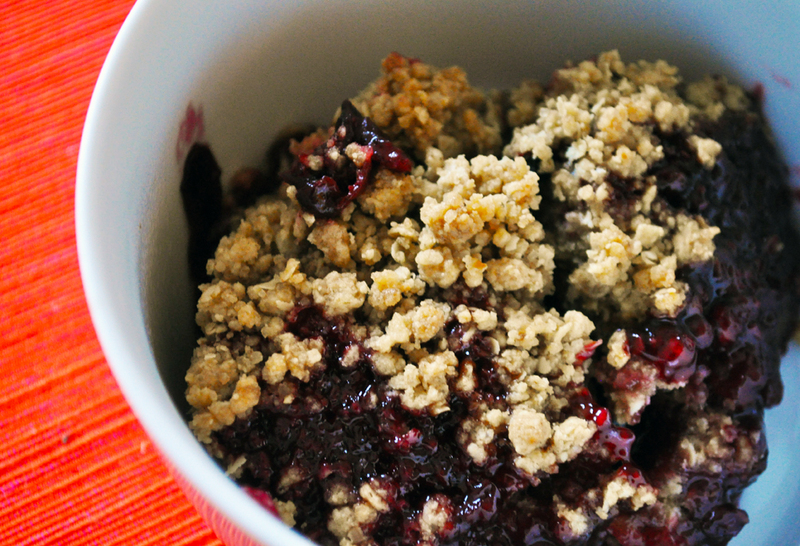 We popped to the farmers market this morning, which reminded me of something we were meant to post a few weeks ago – a picture of our damson crumble that we made with damsons bought last time we were at the market. Is crumble an autumnal thing? I always think of it so, maybe because a good fruit crumble is such a satisfying way to use autumn fruits: damsons, plums, apples, blackberries etc. Apparently some people don’t (de)stone their damsons before cooking. I can’t really agree with that and, while stoning them does take time it’s also vaguely therapeutic. You know you’ve earned a good pudding when your hands are all black and blue with juice. We didn’t stew the damsons first, just popped them straight into the ovenproof dish with a fair bit of sugar and spooned the crumble mixture (recipes widely available – just search the web) on top and cooked in the oven till the fruit was starting to bubble up through the golden crumble top. Oh yes, and I do like to put some oats into the crumble mixture too, especially with darker fruits. I’m not sure why. So, yes, damson crumble. Easy and delicious.